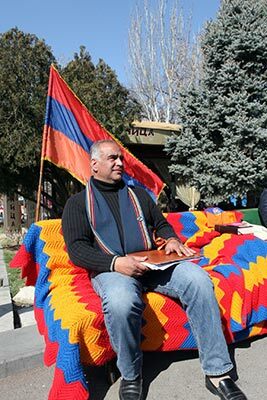 Official runner-up in the February 18 presidential election Raffi Hovannisian, who is challenging the poll results, began his announced hunger strike on Sunday and spent last night in the open air in Liberty Square together with some of his supporters. “The night was wonderful, I was not alone, there were some co-citizens who were by my side till dawn, and sunrise today was very bright,” Hovannisian told ArmeniaNow. The weather today in Yerevan is sunny, with temperature at night around was 2C/35F and Hovannisian says “even the weather is on our side” and that “this is an Armenian’s, an Armenian person’s, Armenian citizen’s weather”. This is not the first time the 53-year-old politician is resorting to hunger strike. Two years ago at the same place, around the same time of year he held a 15-day “Freedom Fast” as part of his struggle against a one-party-led state. This time it is “the new milestone of registering the de jure victory of the Armenian people”. “By depriving myself of food I am at a new stage of our struggle, which I am sure will lead to new Armenia’s inauguration. Mr. Sargsyan has all the qualities of a politician, citizen, Christian, by which he can reconsider his decision and admit that he has not been elected president,” says Hovannisian. On Monday the Constitutional Court started hearings on Hovannisian’s and marginal candidate Andreas Ghukasyan’s petitions appealing the February 18 election results. As the body responsible for the final decision on the election results, the Central Election Commission, represented by its chairman Tigran Mukuchyan, is the respondent in this case along with the Prosecutor General’s office and the Police of Armenia for their respective fields of authority. Court chairman Gagik Harutyunyan says he has received a petition also from Serzh Sargsyan to be involved as a third party. In the Court he will be officially represented by Justice Minister Hrayr Tovmasyan and Republican MP David Harutyunyan.